If a new leak is to be believed, Samsung is going to launch another mid-range smartphone in India soon. 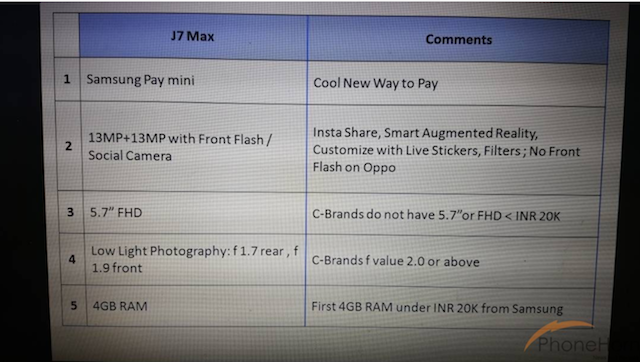 The company apparently has a new device called the Galaxy J7 Max in the pipeline. The leak suggests that it’s going to be positioned in the mid-range segment of the market against popular options from rivals Oppo and Vivo who have already carved considerable space for themselves in India’s smartphone market. The Galaxy J7 Max’s specs may include a 5.7-inch Full HD TFT display with a 1.6GHz octa-core MediaTek MT6757V processor, 4GB RAM and 32GB of storage. It may also feature a 13-megapixel rear camera with flash and f/1.7 aperture as well as a 13-megapixel camera with flash and f/1.9 aperture on the front. Samsung’s upcoming mid-range smartphone for India will run on Android 7.0 Nougat and will even have support for Samsung Pay Mini. According to the report, the company is going to launch this handset in the second week of June. 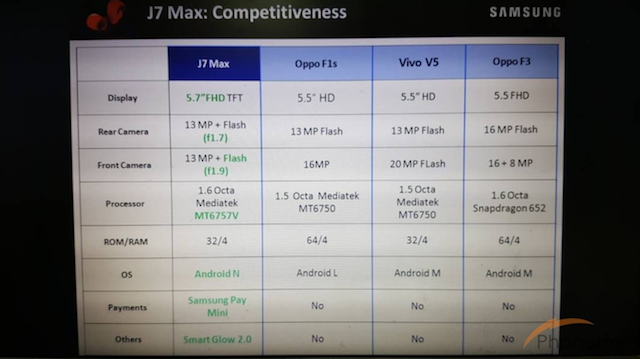 No word as yet whether the Galaxy J7 Max is going to be released in other markets. Since it’s a mid-range smartphone, it won’t be too pricey, those who would like to pick one up can expect the price to be between $250-$300.